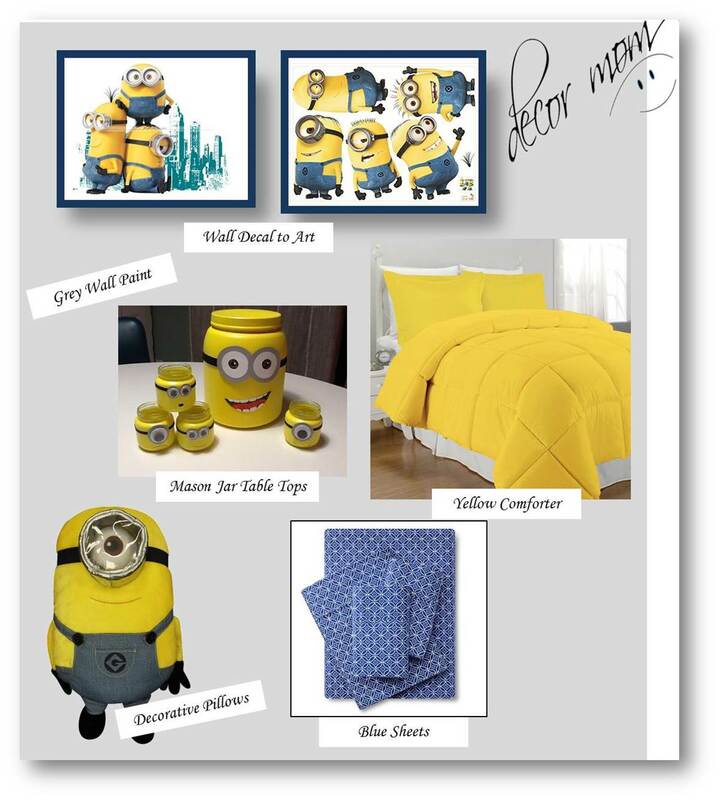 Minion Room Decor is an easy kids bedroom theme to create. If your child loved 'Minions', the movie, he is going to lllllove his Minion themed bedroom. And, really, it is so very easy to create. These cute little yellow and blue beings who speak a language all their own, burrowed their way into our hearts in Despicable Me; and are all the rage today. So how would you go about creating a kids themed bedroom tastefully without over doing it? This is probably the only time that you could make 'a lot' look 'just right'. There are, after all, many minions and the more the minioner, er... I mean, the merrier. Vision Board 1 - Minion TakeOver!! Yes, you can Go Wild with the minions. Have them jumping on your bed, climbing up the drapes, spilling out the waste basket and even peeking behind the furniture! 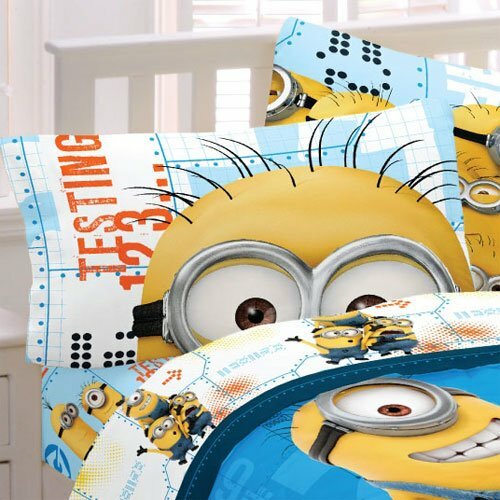 Once you have decided to pack an army of Minions in your kids bedroom, start with the most obvious - the bedding. This cutesy Minion comforter set from Target sets the mood for the rest of the room decor. Have your toddler laze in the flip open sofa which converts to a lounger and boasts a slipcover that you can machine wash! Add the curtains, rug and waste basket to set the minions running loose all over the room. Fill the remaining walls with Minion wall decals, growth chart and the super adorable night light. With the ever growing interest in children's movies, there are new heroes being created every month. It is easy for a child to forget his love for minions and be ready to embrace the new hero of the hour. Vision Board 2 - Minions Not Overdone! So how do you show your kids bedroom theme with his favorite characters without wondering how long this is going to last? Here's what we suggest. Create the look on the bed with these cool blue organic sheets and a cheerful yellow comforter. Add minion themed decorative pillows to the bed to blend in the theme. Paint the walls a very soothing grey color. Not only will the room look spacious, the color can lend itself to any change in theme. Moreover, this would make the yellow and blue of the Minion room decor really stand out. 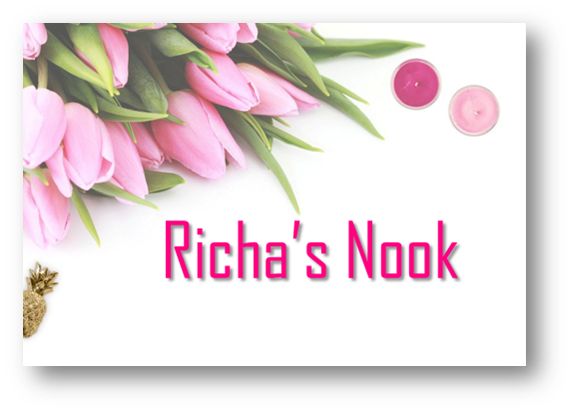 For the walls, instead of sticking the minion wall decals on the wall, stick them inside picture frames for a more formal look. Create minion pencil and other table top knick knack holders from mason jars. All you need is a little paint! Tip: The lids of the mason jars make great Minion Eyes - stick them onto black felt strips and tie around waste paper baskets or flower vases in the room. If you have been following our Facebook page, you might remember the picture we shared. How would you rate this mom's zest for giving her kids a room to remember? 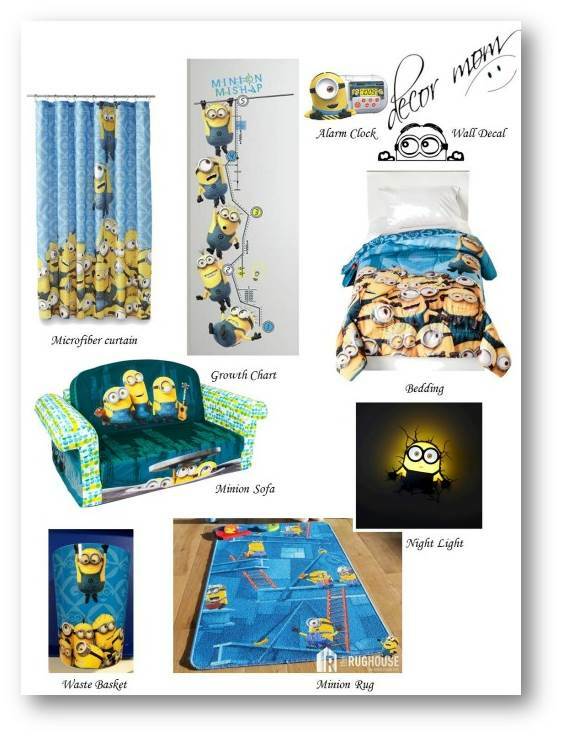 Are you all set to get started with your Minion Room Decor project? We have shown you two extremes when decorating the kids rooms. Whether you allow them to run wild in your room or decide to take the wildness down a couple of notches, these kids bedroom ideas are sure to fire up your imagination.